The number of cars with manual transmissions is dwindling to the point where they are like a small oasis in a dry and cracked desert of automatics. But through the dust emerges a new hero: The 2019 Genesis G70, with an option of three pedals instead of two. Before you get too excited, let me first tell you that the manual option only seems like it’ll be paired with the 2.0-liter turbocharged four-cylinder G70 option. But! It’ll be the rear-wheel drive G70, according to these fuel economy ratings released by the EPA. The rest of the lineup with have automatics. Hey, that’s not so bad! Anyone who’s driven a car with a manual but didn’t have the most powerful engine will back me up on the fact that it’s still fun. 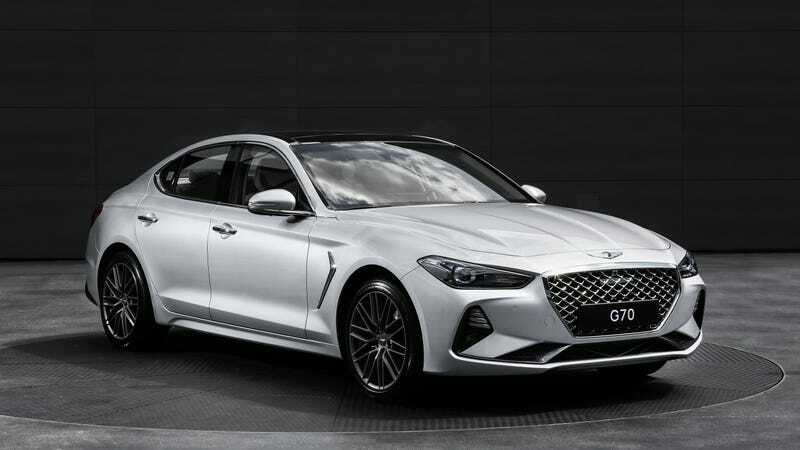 I’m actually more interested in that G70 trim than the top-of-the-line one with the 3.3-liter twin-turbo V6 and the auto. Good on Genesis for throwing a manual into its lineup. Already, the G70 shows a little more gumption than a certain car, which I won’t name here. Let’s just say it’s name rhymes with Mia Winger.